This was forwarded to all the attendees by Jenny Jones’ office. It is not just cars but also motorcycles that often fail to stay out of ASLs. He would be in favour of signage warning of £50 fines for vehicles that encroach on ASLs. Cyclists currently are prohibited from entering ASLs via any means other than the feeder lanes and can be prosecuted for doing so. This needs to be changed. Red bicycles on crossings are not allowed whereas red pedestrians and red horses (in Hyde Park Corner junction) are permitted. Why not red bikes? A big step forward would be for the injury caused to be mentioned in a criminal charge. This would communicate the seriousness of the collision and make the process not just a judgement on the driver’s driving but also on the injury they caused another person (and the impact on that person’s life). Re: the police saying ‘we are not going to enforce 20mph limits’ – elected representatives make these decisions, not the police. Junction outside Victoria Station (Palace Street and Victoria Street) lacks safety features such as ASLs. Police cars are often seen inside ASLs all over London. Accidents should be visible on a map like crimes are on the crime map. Signalling in the city also seems to be optional – why can’t this be enforced with CCTV? We’ve realised that the ‘Cyclists and the Law – Summary of Findings’ report which you recently received contains a factual error. Specifically, the comment ‘Stricter liability makes sense especially if we look at the cyclist as the ‘vulnerable road user’ – motorists cannot be classified as vulnerable’ was incorrectly attributed to Cycling Commissioner Andrew Gilligan. This comment was in fact made by a member of the audience and not Mr. Gilligan who has emphasised that he does not have any position on stricter liability. I was looking back through some notes, and found something I took down whilst at one of the Commercial Vehicle Educations Unit’s ‘changing places’ demonstrations, designed to illustrate HGV/LGV/lorry ‘blind-spots’ to cyclists. This is from 2007, so a little bit out of date. I don’t know why I didn’t put it in my original post. I was speaking to one of the CVEU officers, and he expressed surprise at their strike rate, when stopping LGVs, i.e. how many times CVEU officers stop an LGV (lorry) and find something wrong. I went to the ‘Cyclists and the Law’ panel discussion at City Hall the other night. It was a little disconcerting to find myself back in the cycle-campaigning fold, however slight my current association to any cycle-campaign group is. I wasn’t surprised to see that Dr. Robert Davis is still well capable of clearing any buffet put before him, but I was pleasantly surprised to see some new faces in the otherwise familiar crowd of old friends. The formal outcome of the evening I’ll leave for another post. (Updated: a fairly complete account of the proceedings was forwarded by Jenny Jones’ office.) I wanted to put down some opinions and impressions. Andrew Gilligan is very impressive. I was initially very sceptical of his new calling, viewing his appointment as ‘cycling tsar’ (his ironic title) as a crony sinecure, and doubting his ability to make real changes, but I was very wrong. He appears to have mastered the brief (get more people cycling), and is committed to evidence-based policy, as opposed to anecdotal subjective stuff, such as we have seen from Boris before. As was said in our chat on the Bike Show, I estimate that this is because Boris was genuinely dismayed by how badly he was received in the cycling hustings before the last election, and realises that he has to do something serious and substantial if he is not, in the words of Sonia Purnell, to be seen to have failed London’s cyclists. I was especially struck by the fact that Jenny Jones of the Green Party, who was chairing the discussion, was pretty fulsome in her praise of him, and Jenny is usually very selective in her use of praise. People use statistics in a very slap-dash way, even people from a well-educated and well-briefed audience such as this. One chap got up and said that no cyclists get killed in Paris, which is a big load of pony, complete and utter rubbish. He used the 2011 ‘Paris 0 London 16’ canard, which I discussed in one of my first posts. He also seemed totally unaware that 5 cyclists were reported killed in Ville de Paris in 2012 (remember that Ville de Paris is much, much smaller jurisdiction than Greater London, roughly equivalent to Zone 1). From this I deduce that he got the numbers from the media reports last year about the garbled Paris numbers, which shows the danger of taking statistics from secondary sources, and not looking a bit harder to find out what the real story is. I find it totally reprehensible that people use whatever dodgy number comes to hand to make a case, no matter how unreliable the number may turn out to be. Detective Chief Superindent Wilson also used what I thought was a questionable metric to support his assertion that UK traffic police have nothing to learn from their continental counterparts about reducing road death and injury. The metric was road deaths per head of population. He had the UK (I think it was UK, but may have been England & Wales) at 31 per million, Germany at 49 & France at 61. I’d like to see this number correlated against average vehicle speed, modal share, total distance travelled at the very least for a like-by-like comparison. The number by itself is far too crude a measure to tell us anything very much. I read somewhere (apologies for lack of source!) that France has 5 times the length of road as the UK, which seems plausible, as France is much, much bigger topographically. With roughly the same number of vehicles, this is likely to mean much higher average speeds, which in turn is likely to lead to increased injury and death. This is not the result of the UK’s authorities doing anything particularly clever, just the natural outcome of having congested roads on which it is not often possible to go very fast. 20 miles per hour speed limits are really important. David Arditti thinks they are virtually irrelevant, as he has again said, to the goal of achieving mass-cycling (no need to call me ‘Chidley’, David, you can just call me ‘Bill’), but Wednesday night showed me that if you are interested in getting more people cycling, you need to support 20 mph limits. All the walking organisations, and especially those representing special interest groups like Guide Dogs, are passionate supporters of 20 mph limits. Darren Johnson, chair of the London Assembly, who said during the evening that there was a growing cross-party consensus in the Assembly forming behind the ‘cycling agenda’ isn’t a cyclist. He doesn’t use a car at all, as far as I know, but, like most Londoners, uses public transport to get around. He is very, very concerned that the pro-cyclist agenda does not impede or impinge in any way on pedestrians and public transport users. At some point, bicycle lanes will start to interfere with buses, if a segregated and safe bicycle path is built alongside every main road, as David Arditti is pressing for. When the narrow width of some of London’s main roads is raised as a potential obstacle, the ‘Go Dutch’ answer is to lose a motor-carriageway, making the road 2-way for cyclists, but one way for motor traffic, and diverting the other carriageway to some other street. As I said before, this is likely to be necessary on parts of Clerkenwell Road. This will inevitably mean diverting buses around a longer route. Given that the Bus must always get through, to borrow a phrase from the 1920s, at least as far as TfL seems to be concerned, this is likely to be a sticking point, and not a minor one either. To push major alterations to the London transport network such as this through will require lots of political will and support. Given that cycling is in a single figure minority, it will require the help of other groups apart from cyclists, such as those representing pedestrian interests. It is therefore very, very unwise to go around saying that 20 mph limits are irrelevant or unimportant to cyclist’s interests. The Cycle Task Force nick a lot of cyclists. I was shocked by the numbers, really shocked. The breakdown was 50% motor-vehicles, 26% HGV & PSVs and 24% cyclists, which seems an awful lot of cyclists, given how little injury is caused by bicycles. 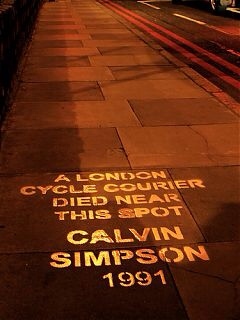 I’m not suggesting that London cyclists are paragons of law-abiding road-users. In fact, I have argued elsewhere that because the laws of the road manifestly do NOT protect law-abiding cyclists, it makes no sense to obey the law, because the laws aren’t there to keep cyclists safe, they are there to make motorists life easier. On reflection, however, there may be something in these numbers that is really interesting. The share may actually be yet another indicator of how many of the vehicles in central London are bicycles. That is probably a number for someone with a very big brain, like Geography Jim, over at Drawing Rings blog to crunch. It’s not a great idea to suggest to a bunch of hardened cycle-campaigners that they should be wearing helmets. Kevin O’Sullivan of Levene’s solicitors suggested that it might be, and he was lucky to escape with his life. There were howls, full-throated wails, of protest at this. Top marks for courage, zero marks for wisdom. Complaining about cyclists jumping red lights is like complaining about queue-jumping in a bank whilst an armed robbery is taking place. If it was someone else, my apologies for misattributing it, but it does sound like something Bob would say. Disclaimer: I am actually a pretty law-abiding road-user these days, probably as law-abiding as anyone, in any class of vehicle, on the road. I used to be a bicycle courier (or messenger if you prefer), and if I obeyed the law, I lost money in earnings because I was slower than the other riders I was competing against for work who did not obey the law some or most of the time. I guess my attitude now is that I really can’t be bothered to break the law if no-one is paying me to do it, but when I was a courier, it didn’t make sense to obey the law, everything else being equal. I did try to be careful to respect the safety of other road users, particularly vulnerable ones. Balanced against the economic imperative not to stop was the economic imperative not to get injured. Nearly all couriers are classified as self-employed sub-contractors, and so do not receive pay when off work due to injury (or sickness). In other words, if you rode like a crazy person, and crashed all the time, you wouldn’t make any money, because you would be on your back instead of on your bike. I noted in this article that a courier had been stopped and ticketed by the Met for red light jumping (RLJing), and told that the police were cracking down on RLJing because a cyclist had recently been run over by a lorry. 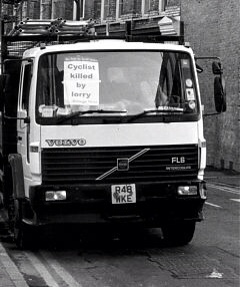 This despite the fact that cyclists involved in collisions with lorries (HGVs) are almost always in compliance with the law at the time of the collision. Another courier was stopped by the police, and given the option of attending a safety course instead of a fine. The safety course was this week. It was a session in a lorry, observing the blind-spots. The courier’s offence? Riding on the pavement. As I said, I totally get that the police get more complaints about misbehaviour by cyclists than any thing else (including violent crime etc), so they need to be seen to do something; I also get that if you break the law, you should be prepared to accept the consequences, but I do find the association between anti-social behaviour and critical injury to cyclists by lorries really quite offensive. There’s a lot of talk about ‘subjective safety’, notably by the kerb nerds, but also by cycling advocacy groups generally. Subjective safety is what stops more people from riding, according to the surveys. Subjective safety probably explains why a female friend found cycling in London too daunting, and now rides a motor scooter, despite the scooter being objectively more dangerous as a mode of transport than the bicycle. Subjective safety explains why cyclists are far more concerned about being crashed into from behind whilst moving along in a straight line along a straight road, when in fact they are much more at risk when stationary, or moving off from stationary, at a junction. Subjective safety explains why the public view cyclists as a major threat to public safety, when in fact cyclists are, almost without execption, an irritant, and that pedestrians are far more likely, by a factor of several hundred, to be killed whilst walking on the pavement (sidewalk for any N Americans) by a motor vehicle. Please – & I think it is more women doing it TAKE OUT THOSE F* EARPHONES. Too many die for music. If you’re relying on hearing danger, as opposed to having a good look around you, I would suggest that you are likely to come a cropper whether you’re listening to bird-song or the latest offering from Motorhead. Most headphones are totally inadequate in a competition with road-traffic noise, and some motor-vehicles are virtually silent, as are cyclists & pedestrians. Cycling with head-phones does look dangerous, but objectively, it’s probably not any more dangerous than cycling without a hi-vis vest. Elazar Gabay says “bicyclists have the same rights and duties as other drivers” then just a few sentences later complains that “at times they (bicyclists) occupy the entire lane …”. Well, if they have the same rights, and motorists have the right to use the full lane, then shouldn’t bicyclists, too? In fact, it doesn’t make sense that the exact same rules should apply to motorists and cyclists (and indeed it’s not the case). The difference in speed, mass and size means that sometimes they should be treated differently. Everyone breaks whatever rules they think they can safely get away with. Motorists speed all the time; cyclists can’t because their vehicle can’t. Cyclists go against one-ways all the time; motorists can’t because their vehicle is too wide. Where motorists think they see cyclists breaking so many rules, they are only seeing different rules being broken, due to physical differences between vehicle types. Motorists have long since internalized their own rule breaking as socially acceptable. Cyclists are no more scofflaw than motorists. The correspondent correctly, in my view, identifies that it is subjective safety that is the issue here. Motorists do dangerous things in their vehicles, but this behaviour (speeding etc) has been normalised and is socially accepted, the way drink-driving was 30 years ago, whereas cyclists’ behaviour is unusual and doesn’t fall into social norms and so looks dangerous. On balance, cyclists’ illegal behavior—like that of pedestrians—adds much, much more convenience to life than danger. Aggressive enforcement of traffic laws could upend the fragile system of incentives that leads thousands of people to undertake a long and sweaty commute each day. Why should people riding 20-pound bicycles obey laws designed to regulate the conduct of 4,000-pound cars, to say nothing of accepting the same penalties? In terms of the damage we can cause and sustain in an accident, cyclists have more in common with pedestrians than cars and should be treated accordingly. I know that there is a discourse about respect, recently advanced by a cycling writer that I respect, Ned Boulting, who got a bit backward when I pulled him up on it, more or less running that if we want to be taken seriously, we need to behave seriously, i.e. if we don’t stop running red lights and riding on the pavement, we won’t deserve to have decent provision. This is total pony, and the argument doesn’t stand up to any examination. Objectively a majority of motorists break the law relating to speed. Since when did anyone get up and say ‘well, until the motorists stop speeding, we’re not going to build that new motorway, because they’ll only use it drive even faster than they are doing now’?